This special concert, held at the Annisquam Village Church, is offered in conjunction with Voicing the Woods: Jeremy Adams, Instrument Maker, on view at the Cape Ann Museum from October 22, 2016 through February 26, 2017. Organist Kevin Birch will play the Adams Organ, built in 1986, and a clavichord (also built by Adams, in 1999). 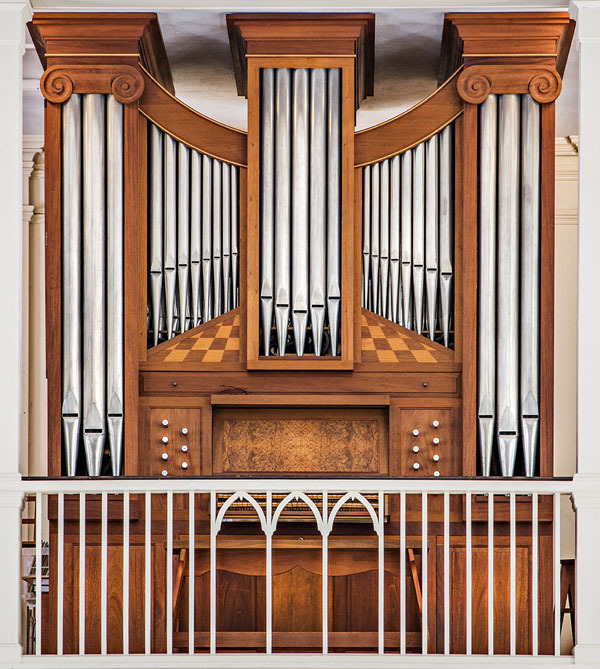 The thirteen-stop, double manual, mechanical (tracker) action organ with its trompe l'oeil pipe shades that reference baroque instruments in Brittany, exemplifies the bold and individual voicing for which Adams is known. The fretted, bi-chord clavichord, historically used as a practice instrument by organists, is inspired by a 1796 instrument of Manuel Carmo, offering a contrasting intimacy of sound. Birch has performed throughout the United States, Europe and South America. He holds the Doctor of Musical Arts from the University of Iowa with previous studies at the Sweelinck Conservatory (Amsterdam) and the New England Conservatory (Boston). He serves as Organist and Director of Music at St. John's Catholic Church in Bangor. He is Executive Director of St. John's Organ Society and is a faculty member at School of the Performing Arts, University of Maine. The Annisquam Village Church was established as the Third Parish of Gloucester in 1728 to serve people living in the areas of Annisquam, Bay View, Lanesville and Sandy Bay. Located at the head of Lobster Cove at the corner of Washington and Leonard Streets, the 1830's building is renowned for its graceful beauty and extraordinary acoustics. This program is $10 for Cape Ann Museum and American Guild of Organists Society (AGO) members / $15 for nonmembers. Tickets can be purchased by calling (978) 283-0455 x10 or online at Eventbrite. Advance tickets are required. Voicing the Woods has been generously sponsored by Jerry and Margaretta Hausman, Hinda Simon, Bettie Cartwright, Gregory and Stevie Neal, Robert M. Russell and Jane Deering Gallery. 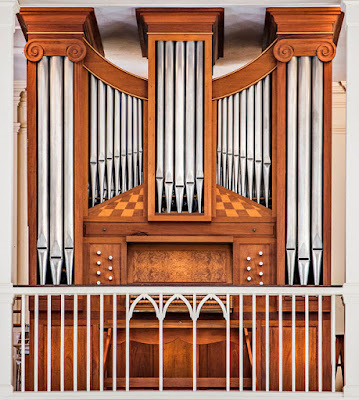 Jeremy Adams Organ, 1986. Annisquam Village Church, Gloucester, MA. Photograph 2016 by Paul Cary Goldberg.